Live MP Election Results 2018: BJP's Chief Minister Shivraj Singh Chouhan has resigned from the post. Meanwhile, BSP chief Mayawati has announced that two of her party MLAs in Madhya Pradesh will back the Congress, helping it to go past the magic figure of 116 in 230-member House. Live MP Election Results 2018: A resurgent Congress Tuesday won the Madhya Pradesh Assembly Election 2018 in a nail-biting contest. In the counting which lasted for more than 14 hours, the Congress emerged victorious with 114 seats. Bharatiya Janata Party, which was facing an anti-incumbency of 15 years, fell a little short of the majority with 109 seats. Mayawati-led Bahujan Samaj Party and Akhilesh Yadav led Samajwadi Party emerged victorious on 2 and 1 seats, respectively. The SP announced in the day that its winning candidates support the Congress. It was an absolute thriller as the counting lasted for more than 14 hours and the trends remained fluctuating throughout the day. PM Narendra Modi accepted the defeat in the elections and said that he accepts the mandate of the people. “The family of BJP Karyakartas worked day and night for the state elections. I salute them for their hardwork. Victory and defeat are an integral part of life. Today’s results will further our resolve to serve people and work even harder for the development of India,” Modi tweeted. Congress chief Rahul Gandhi also spoke to media and thanked his party workers for the efforts they made during the campaign. He also targeted PM Narendra Modi saying that the defeat was clear cut message for the latter. The BSP has announced that its two MLAs will support the Congress in Madhya Pradesh. Maywati said that even though BSP doesn't agree with many of Congress' policies, "we have agreed to support them in Madhya Pradesh and if need be in Rajasthan." MP CM race: Who will become next Chief Minister of Madhya Pradesh? Senior leaders Jyotiraditya Scindia and Kamal Nath have emerged as the top contenders for the chief minister's post. Both, Kamal Nath and Scindia, didn't contest assembly elections but were considered as the face of the elections. The Congress has won 114 seats in 230 seats Assembly in Mashya Pradesh. The magic figure to form government is 116. The BJP, which was in the power since 2003, won 109 seats. The Samajwadi Party has announced that the its lone MLA will support the Congress. The BSP of Mayawati had contested elections solo and won 2 seats. The Congress party is leading at 115 seats and has received the support of 2 MLAs from the Samajwadi Party. In total, Congress is already leading at 117 seats. If the trends turn into final outcome, the Congress would return to power in Madhya Pradesh after a gap of 15 years. The BJP has won 1 seat in the state and is leading on 104 seats. 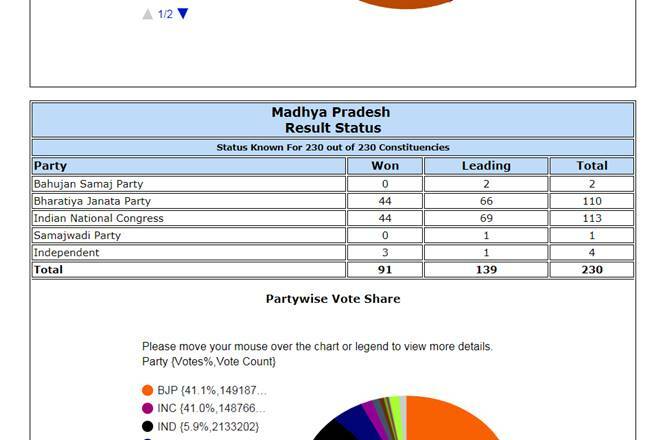 The Madhya Pradesh Assembly Election result have opened as a thriller. After trends on around 225 seats, Congress is leading on 111 seats, while the BJP is leading on 109 seats. In a way, the contest has remained neck and neck. After initial trends, some of the Congress candidates were seen celebrating. However, they must be glued to the TV sets after the latest trends. We are yet to hear from any of the parties. Dedicated teams deployed to ensure full security. Diversion points put on roads outside centres. There's a 3-tier security system. Any device that can help communication isn't allowed inside. The Madhya Pradesh Assembly has 231 members. While 230 are elected through an electoral college, 1 is nominated by the governor. The elections are held every 5 years. Any contesting party has to garner the support of 116 MLAs in order to claim the majority. The current ruling party, BJP, has 167 members in the assembly. The Opposition, Congress, is led by Ajay Singh and has 57 members in the Assembly. MP election result: Why is Madhya Pradesh Important? Madhya Pradesh is geographically India's largest state and falls in the centre of its political map. The state sends 230-members to the state assembly who elect the chief minister, and 29 members to the Lok Sabha or the Lower House of the Parliament. The results in the state this time are considered to be a prelude to 2019 Lok Sabha elections. Last time, the Shivraj Singh Chouhan led BJP, riding on a Modi wave, had won a landslide victory with 167 seats. The Congress had suffered a debacle as it could only manage to win 57 seats. Shivraj Chouhan, Jyotiraditya Scindia or Kamal Nath - who will be the chief minister? From the BJP, CM Shivraj Chouhan is eyeing a fourth term as the chief minister. From the Congress, there is a stiff competition between party's state unit chief Kamal Nath and campaign committee chief Jyotiraditya Scindia. While Chouhan has been a three time CM, Kamal Nath and Scindia have been Union Ministers in earstwhile Manmohan Singh Government. The two Congress leaders have also held senior positions in party's state and central leadership. Chouhan is contesting elections from Budhni, however, both Scindia and Kamal Nath are not contesting elections as they are sitting MPs from Guna and Chhindwara. Scindia accuses BJP of destroying "institutional framework"
The Madhya Pradesh unit of the Congress addressed a press conference after legislative party meet. Party spokesperson Shobha Ojha apprised media that a proposal was passed and the decision to choose the chief minister was left on party chief Rahul Gandhi. The Congress legislative party was attended by both Kamal Nath and Jyotiraditya Scindia - both non-MLAs and top contenders of the CM post. The Congress legislature meet has concluded in Bhopal, Madhya Pradesh. A one-line proposal has been passed. The High Command will take a decision on the Chief Minister face. 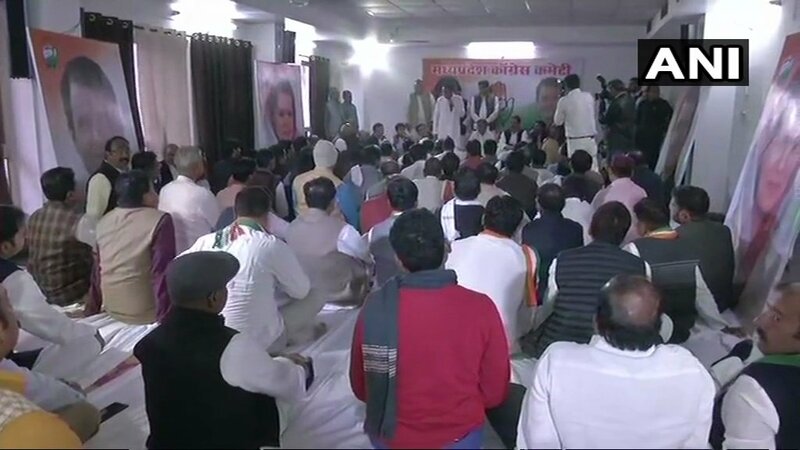 Congress Legislature Party (CLP) meeting is underway in Madhya Pradesh's Bhopal. 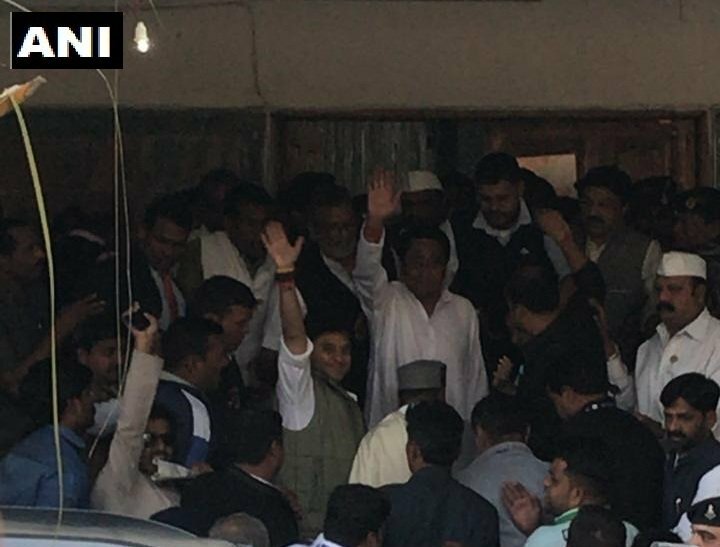 Top CM contenders - Kamal Nath and Jyotiraditya Scindia - are attending the meet. Both the leaders waved at the crowd before leaving for the meet. Earlier the two leaders had received observer AK Antony at the Bhopal Airport. - Shivraj Singh Chouhan thanked Prime Minister Narendra Modi and BJP chief Amit Shah. - The outgoing chief minister said that he takes the full responsibility for the defeat. - "Kami kahi na kahi meri hai, kendra ke itne acche sahyog ke baad bhi hum apekshit parinaam nahi la paaye, iska poora poora dosh mera hi hai," Shivraj Chouhan said. Senior Congress leaders, including Kamal Nath, Jyotiraditya Scindia, Digvijay Singh, Arun Yadav and Vivek Tankha, met the governor to stake claim to form the government in the state. "The Congress has emerged as the single largest party with majority support. 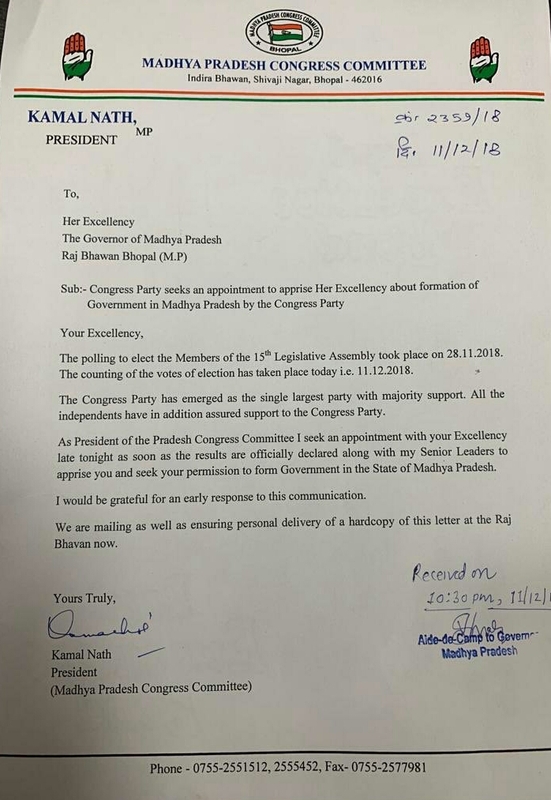 The BSP, the SP and Independents have assured their support in favour of the Congress," Nath, the state Congress chief, said in a letter to the governor. He further requested the governor in the letter to call the Congress to form government in the state. 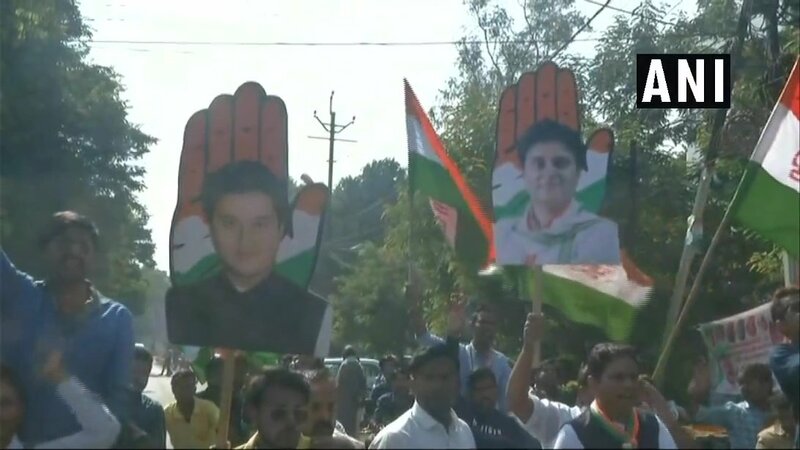 Here are some visuals of Congress workers celebration from Bhopal, Madhya Pradesh. The grand old party has the support of 121 MLAs in the Madhya Pradesh Assembly, party spokesperson Narendra Saluja claimed Wednesday. The party won 114 seats in the state polls, but was two short of the simple majority mark of 116 in the 230-member Assembly. 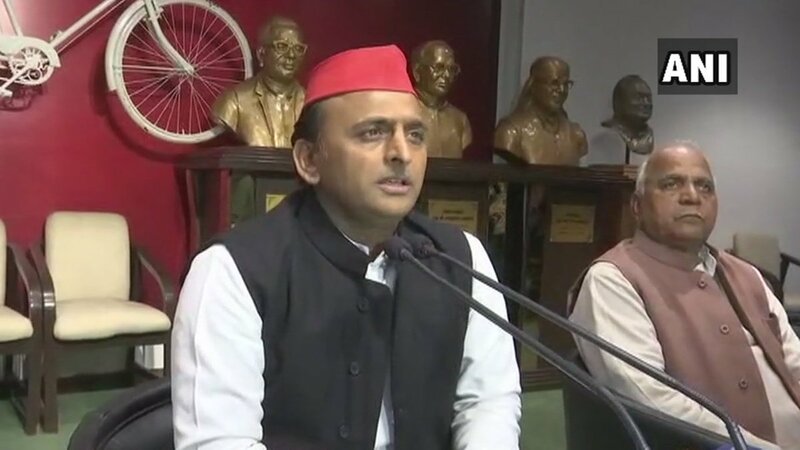 Akhilesh Yadav, former UP CM: We welcome the mandate. We didn't perform well but we would like to thank the public of Madhya Pradesh for supporting us. We have decided to support Congress in MP. BJP has spread hatred&deceived public, they will be given an answer in LS elections. Congress' CM hopeful Jyotiraditya Scindia has thanked the people of Madhya Pradesh. He has said that Congress will work for people's aspirations and fulfil it promises. He also said that Congress has fared well in Gwalior-Chambal region. He said that the party has won 26 in the region. The Scindia family is considered a dominant force in Gwalior Chambal region. 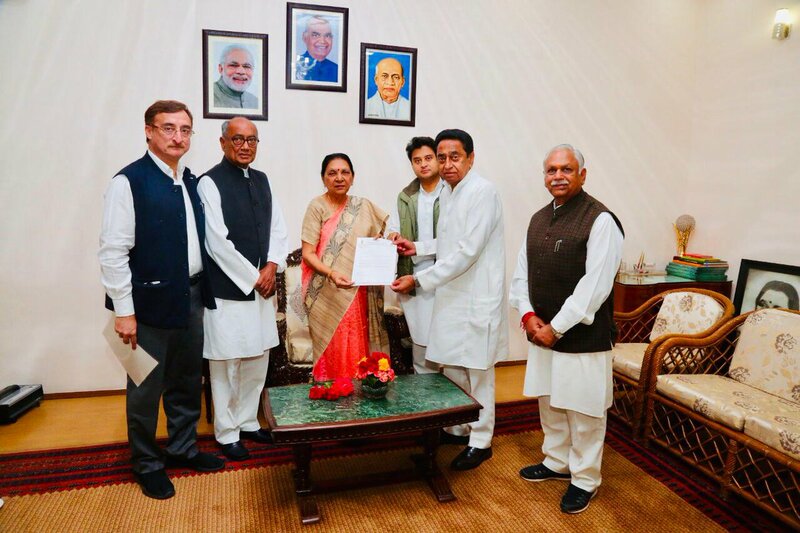 Senior Congress leaders Jyotiraditya Scindia, Kamal Nath and Digvijaya Singh have met MP Governor Anandiben Patel. The leaders have handed over a letter to the governor where they staked claim on the government. Earlier in the day, Shivraj Singh Chouhan met Patel and submitted his resignation. Narendra Saluja, who was a part of delegation which met the governor, said that the Congress party has the support of as many as 121 MLAs. 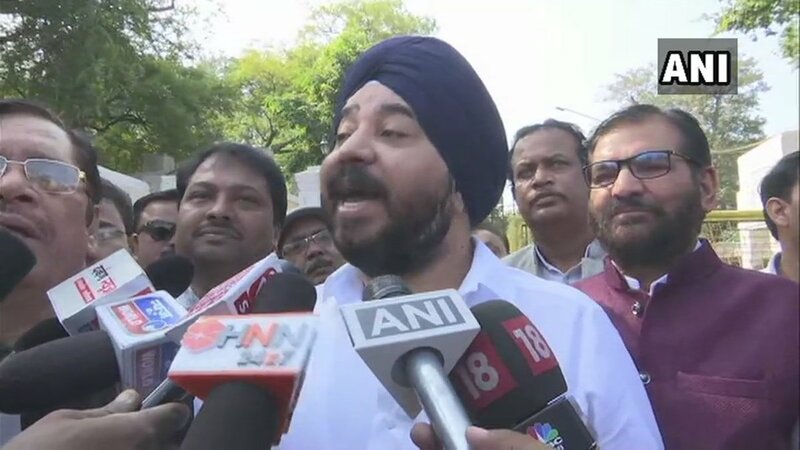 "We have met Governor and staked claim to form Govt, we have the support of 121 MLAs, the situation is clear," Saluja said. A delegation oc Congress party comprising senior leaders -- Kamal Nath and Jyotiraditya Scindia, met Governor Anandiben Patel at the Rav Bhavan in Bhopal. The delegation staked claim to form the next government in the states. Congress spokesperson Shobha Oza informed that senior party leader Kamal Nath will meet former CM Shivraj Singh Chouhan as a courtesy visit. At 4 PM we have a meeting of party MLAs and AK Antony is coming as observer and after it we will put in a word with Rahul ji. 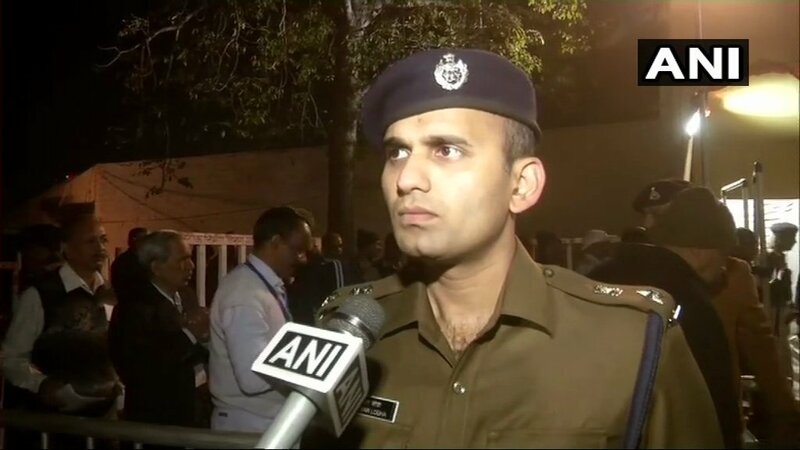 Meanwhile, in a boost to the Congress, Akhilesh Yadav of Samajwadi Party has announced that his lone MLA in Madhya Pradesh will support the Congress. 'Will support Congress in forming the government in Madhya Pradesh,' he said. With support from 1 SP MLA and 2 BSP MLAs, the Congress has now support of 117 MLAs. Shivraj Singh Chouhan arrives at Raj Bhavan to tender his resignation. Shivraj was made the Chief Minister of Madhya Pradesh in November 2005. He guided the BJP to power twice in 2008 and 2013 with a brute majority. BJP's three-time Chief Minister Shivraj Singh Chouhan announced that he will not stake claim to form government. He said, "We did not get majority, will not stake claim to form government. I am going to tender my resignation to the Governor." A delegation of Congress party will meet Governor Anandiben Patel in Bhopal on Wednesday at 12 noon to stake claim to form the next government. The delegation will comprise Congress' state unit chief Kamal Nath, senior leader Digvijaya Singh and Jyotirditya Scindia. The Congress has support of 117 MLAs in 230-member House. BSP chief Mayawati said that the results of assembly elections in 5 states show that people in states like Chhattisgarh, Rajasthan and Madhya Pradesh were totally against the BJP and its anti people policies and as a result chose Congress due to lack of other major alternatives. BJP's three-time Chief Minister Shivraj Singh has not resigned from the post. He has also not made any comment so far. According to reports, Shivraj is likely to address the media shortly. Shivraj is BJP's key leader in the state and has been sitting at the helm of affairs in the state since November 2005. Madhya Pradesh BJP president Rakesh Singh in a tweet said mandate in Madhya Pradesh is not in favour of Congress. He claimed that indepndents, others are in touch with the BJP and the party will will approach the Governor to stake claim to form govenrment. Three-time Madhya Pradesh Chief Minister Shivraj Singh Chouhan will address the media shortly. The BJP has finised second with 109 seats while Congress emerged as the single largest party with 114 seats. Congress' Madhya Pradesh unit president has exuded confidene that Samajwadi Party and BSP will support the grand old party. The SP has 1 MLA while the BSP has 2 MLAs. While the SP has declared support for Congress, the BSP is yet to make a formal announcement. On Tuesday, Congress president Rahul Gandhi said that the SP and BSP have ideology similar to Congress, dropping hints that his party is ready include them into the government. Now all eyes are set on Governor Anandiben Patel. Congress' MP unit president said that he has written to Governor to stake claim to form the next government. But he is yet to get a confirmation. According to reports, Patel has said that she will give appointment only after a formal announcement from the Election Commission regarding finall tally. The Madhya Pradesh Legislative Assembly has 230 seats and the magic figure to form a government is 116. The Congress has 114 MLAs and the Samajwadi Party has already announed that its lone MLA will back the Congress. Meanwhile, there are reports that the BJP was mulling to stake claim to form government. The Election Commission of India has declared the results for 230 Assembly seats in Madhya Pradesh. The final result is like this: Congress- 114 seats, BJP- 109 seats, BSP- 2 seats, Samajwadi Party- 1 seat, Independents- 4. In the 2013 Assembly polls, the BJP under Shivraj Singh's leadership had won 163 seats. The Congress was restricted to just 58 seats. 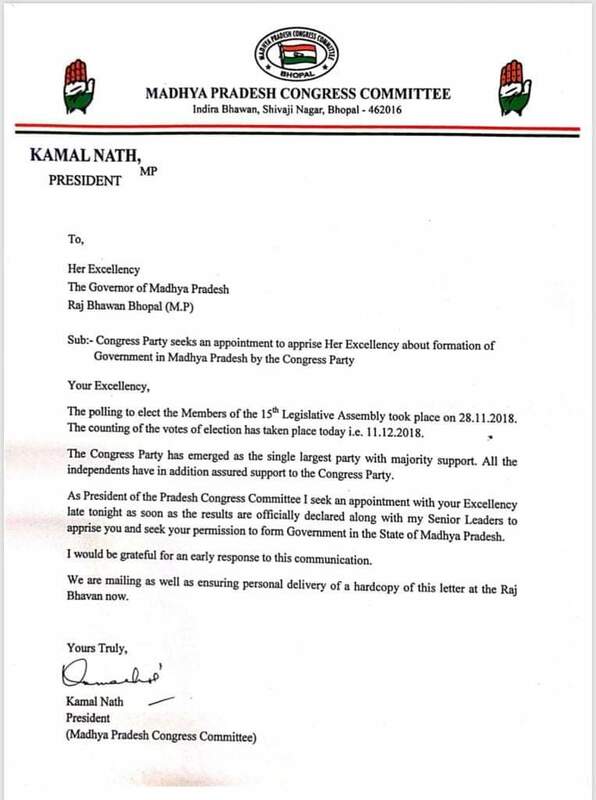 Governor house has received the letter from Congress MP unit President, Kamal Nath. Congress party will go to the Governor House and has sought an appointment late tonight with the Governor to stake their claims to form the govt in the state. The party has sought appointment by sending an email and a fax too. State Party President, Kamal Nath, said in a letter. - "We accept the people’s mandate with humility. I thank the people of Chhattisgarh, Madhya Pradesh and Rajasthan for giving us the opportunity to serve these states. The BJP Governments in these states worked tirelessly for the welfare of the people,"
- Congratulations to the Congress for their victories. Congratulations to KCR Garu for the thumping win in Telangana and to the Mizo National Front (MNF) for their impressive victory in Mizoram. The family of BJP Karyakartas worked day and night for the state elections. I salute them for their hardwork. Victory and defeat are an integral part of life. Today’s results will further our resolve to serve people and work even harder for the development of India. - The family of BJP Karyakartas worked day and night for the state elections. I salute them for their hardwork. Victory and defeat are an integral part of life. Today’s results will further our resolve to serve people and work even harder for the development of India. As per the latest trend shared by the Election Commission India, the Congress is leading in 113 seats, while the BJP is leading at 109 places. The BJP is leading at 4 places, SP is leading at 2 seats, while the independents are leading at 4 seats. Congress President Rahul Gandhi: This is a victory of Congress workers, small traders, farmers. This is a big responsibility for Congress party and we will work on this. Congress President Rahul Gandhi: We are going to provide these states a vision. We are going to provide these states a govt that they can be proud of. On being asked a question on election of the chief minister, Rahul Gandhi said that there will be absolutely no issue in selecting the chief minister. "Vo ho jayega," Gandhi said. 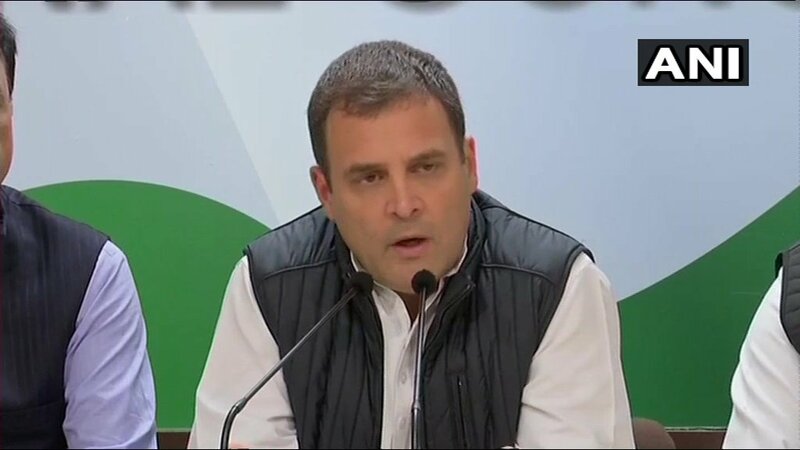 Congress chief Rahul Gandhi has said that the election outcome is a clear cut message to Prime Minister Narendra Modi that the country is clearly not happy with what they have done while being in the government. Congress president Rahul Gandhi Tuesday addressed a press conference and said that the credit for party's victory in the elections goes to the party wokers who worked in the difficult circumstances. "Mai Congress party ke karyakartao se kehna chahta hu, ki jo aapne dil se mehnat ki, mai uske liye apka dhanyawaad karna chahta ju," Gandhi said. (I want to thank the party workers for all the hard work they put in). The Congress chief said that a lot of work has to be done in the state of Madhya Pradesh. The BJP had won 166 seats in the last elections held in the year 2013. The Congress had faced a debacle with 57 seats. For BJP, Prime Minister Narendra Modi and party chief Amit Shah have run an extensive campaign. Also seen pushing party's Hindutva agenda this time was Uttar Pradesh chief minister Adityanath Yogi.